Technology is revolutionizing the medical field with the creation of robotic devices and complex imaging. Though these developments have made operations much less invasive, robotic systems have their own disadvantages that prevent them from replacing surgeons. Minimally invasive surgery is a broad concept encompassing many common procedures that existed prior to the introduction of robots, such as laparoscopic cholecystectomy or gall bladder excisions. It refers to general procedures that avoid long cuts by entering the body through small (usually about 1cm) entry incisions, through which surgeons use long-handled instruments to operate on tissue within the body. Such operations are guided by viewing equipment (i.e. endoscope) and, therefore, do not necessarily need the use of a robot. However, it is not incorrect to say that computer-assisted and robotic surgeries are categories under minimally invasive surgery. Both computer-assisted and robotic surgeries have similarities when it comes to preoperative planning and registration. Because a surgeon can use computer simulation to run a practice session of the robotic surgery beforehand, there is a close tie between these two categories and this may explain why some people often confuse them as interchangeable. However, their main distinctions lie in the intraoperative phase of the procedure: robotic surgeries may use a large degree of computer assistance, but computer-assisted surgeries do not use robots. Computer-assisted surgery (CAS), also known as image-guided surgery, surgical navigation, and 3-D computer surgery, is any computer-based procedure that uses technologies such as 3D imaging and real-time sensing in the planning, execution and follow-up of surgical procedures. CAS allows for better visualization and targeting of sites as well as improved diagnostic capabilities, giving it a significant advantage over conventional techniques. 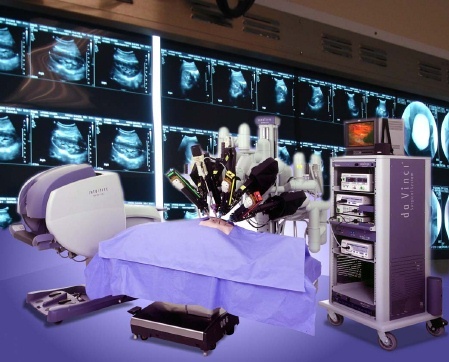 Robotic surgery, on the other hand, requires the use of a surgical robot, which may or may not involve the direct role of a surgeon during the procedure. A robot is defined as a computerized system with a motorized construction (usually an arm) capable of interacting with the environment. In its most basic form, it contains sensors, which provide feedback data on the robot’s current situation, and a system to process this information so that the next action can be determined. One key advantage of robotic surgery over computer-assisted is its accuracy and ability to repeat identical motions. 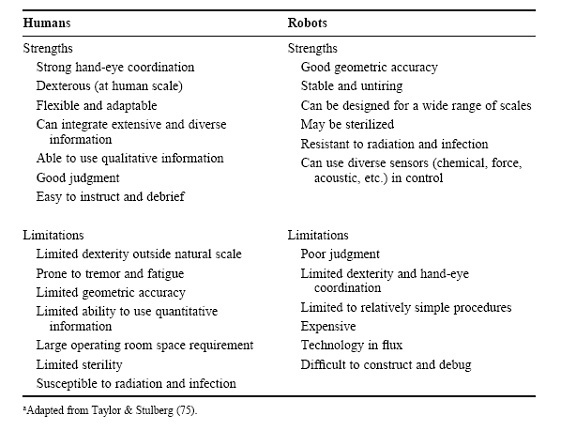 Robotic surgery can be further divided into three subcategories depending on the degree of surgeon interaction during the procedure: supervisory-controlled, telesurgical, and shared-control. In a supervisory-controlled system, the procedure is executed solely by the robot, which will act according to the computer program that the surgeon inputs into it prior to the procedure. The surgeon is still indispensable in planning the procedure and overseeing the operation, but does not partake directly. Because the robot performs the entire procedure, it must be individually programmed for the surgery, making it extremely expensive to gather several images and data for one patient. A telesurgical system, also known as remote surgery, requires the surgeon to manipulate the robotic arms during the procedure rather than allowing the robotic arms to work from a predetermined program. Using real-time image feedback, the surgeon is able to operate from a remote location using sensor data from the robot. Because the robot is still technically performing the procedure, it is considered a subgroup of robotic surgery. The da Vinci® Surgical System, the current leading device in this field, belongs to this section of robotic surgery. The third shared-control system has the most surgeon involvement. The surgeon carries out the procedure with the use of a robot that offers steady-hand manipulations of the instrument. This enables both entities to jointly perform the tasks. Before these procedures can be carried out, robotic surgery requires the use of computer imaging to diagnose and perform the operation. These imaging modalities can generate either 3-D figures through computed tomography (CT) and magnetic resonance imaging (MRI) or 2-D ones through ultrasonography, fluoroscopy, and X-ray radiography. Out of the various methods of imaging, the main one in use is computer tomography (CT). CT scans use back projection and detectors to obtain cross-section images that are particularly useful when diagnosing cancers and viewing the chest and the abdomen. This kind of imaging is critical to diagnosis. Because these images can pinpoint pathologies, the surgeon is given a great degree of precision in guiding the instruments around healthy tissue with minimal injury. However, before the procedure can be carried out, there are three steps that must be overcome: planning, registration, and navigation. Planning is achieved through the careful observation of the images that are generated through these different imaging modalities. The surgeon uses this information to determine surgical pathways and methodologies. Following this step, the surgeon must coordinate the image data with the actual patient in a process known as registration. Once this is achieved, a surgeon or robot can implement the navigation step. Using the planning and images, surgeons can manually guide instruments through the patient (computer-assisted) or robotic arms can carry out the procedure (robotic) using sensor feedback. The decision between robotic or manual navigation depends on cost, safety concerns, difficulty of execution, and other factors. These variables are changing, however, with the advent of cheaper robotic production methods and added safety features. Because computer-assisted and robotic surgeries are so integrated, the advanced imaging techniques and robotics we explore will be classified as robotic surgery, or computer-assisted robotic surgery. Even if nothing is ever one hundred percent safe, devices have the potential to be fatal if they malfunction. Therefore, considerable consternation exists in the medical field over these equipment. Industries have attempted to reduce these risks through redundant sensors and robot movement barriers, but these safety features increase cost, making them inaccessible to some physicians. Nevertheless, robotic arms can access the body much easily through the small incisions than a surgeon can, and can integrate large amounts of data and images to access areas deep within the body with precision. And though they cannot process qualitative information to make judgments during the surgery, they are still able to filter out hand tremors and scale the surgeon’s large movements into smaller ones in the patient. Source: Table from Howe, RD, Matsuoka, Y. “Robotics for Surgery.” Annual Review Biomedical Engineering. 1999, 01:213. As will be seen, robots do not actually replace humans but rather improve their ability to operate through the small incisions. In programming these devices, considerable effort is put into creating proper algorithms, accurate sensors, and improved user interfaces. Technology is becoming more and more integrated into the medical system. From imaging systems to preprogrammed robots, each specialty is finding benefits from these advances. In this website, we will explore the influence of computer-assisted surgery on neurosurgery, orthopedics, urology, and cardiology as well as look into current trends and future outlooks for this growing field in medicine.